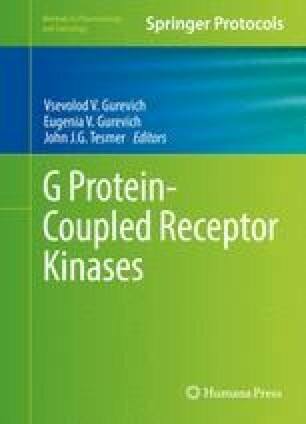 The importance of G protein-coupled receptor (GPCR) kinases (GRKs) as regulators of GPCR signaling has been widely recognized. In humans, GRKs constitute a family of seven protein kinases involved in the phosphorylation and desensitization of agonist-activated GPCRs in many physiological processes. The GPCR desensitization process is initiated by GRKs, but involves several subsequent steps including arrestin capping of phosphorylated receptors. High-resolution crystal structures were determined for four members of the GRK family, i.e., GRK1, GRK2, GRK5, and GRK6. This allowed decoding of the molecular basis of GRK activation and interactions with GPCR substrates, as well as the GRK interactions with cellular membranes and inhibitors. Here, we focused on retinal GRKs, or photopigment kinases, rhodopsin kinase (GRK1), and GRK7, in the context of major general advances in the GRK field. We thank Drs. Leslie T. Webster Jr., and members of Palczewski laboratory for helpful comments on this manuscript. This work was supported by funding from the National Institutes of Health EY009339 (KP), EY025451 (KP), the Arnold and Mabel Beckman Foundation (KP), the Canadian Institute for Advanced Research (CIFAR), and the Foundation Fighting Blindness (KP). K.P. is John H. Hord Professor of Pharmacology.